PREDRAG GOSTA was born in Belgrade, Yugoslavia. He started exploring music at the age of six through initially studying violin, and later continuing training in voice, harpsichord and conducting. While pursuing his postgraduate studies at Trinity College of Music in London, Predrag founded New Trinity Baroque, which was immediately noticed for its lively and captivating performances. 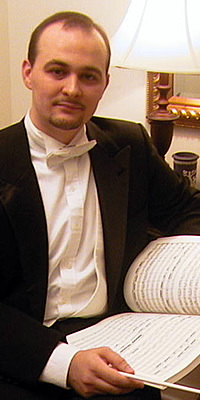 He also holds a triple Master of Music degree from Georgia State University in Atlanta, where he concentrates most of his time with the group in concert performances and presenting lectures. Predrag has received training in historical performance practice through working closely with many experienced early music artists, including Emma Kirkby, Julianne Baird, Andrew Lawrence-King, and others, and most notably with Michael Fields and Evelyn Tubb, with whom he has been collaborating in numerous projects. Described by the critics as "an artist of dynamic temperament and impeccable expression" (Radio Television Belgrade), he has been featured on both the concert and the operatic stage equally as a conductor, vocal soloist, and harpsichordist. He has performed at numerous festivals, including the Boston and Amherst Early Music Festivals, Dartington International Summer School in England, and the Belgrade International Early Music Festival in Yugoslavia, of which he was the Artistic Director for several years.